Glam Morena: Swatches: Ricky's NYC Mattese Elite. Swatches: Ricky's NYC Mattese Elite. I recently had an opportunity to try some nail polish that is sold at Ricky's NYC. Ricky's NYC carries hair products, makeup, makeup tools, and a lot more! The brand of polish that I'll be featuring on this post are by Mattese Elite. They have a great range of nail polish shades and they retail for $5.99 each. You can click here to purchase from this collection. Swatches of the Mattese Elite Cosa Nostra Collection! 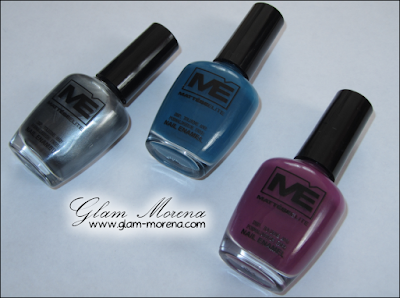 Do you own any Mattese Elite nail polish? Favorites? awesome colors...great for the fall season!! I love the colors. Now the question for me is? How long does the polish last without chipping? This is something I may have to experiment with myself. Alot of polishes chip away in a matter or 2-3 days :( Makes me sad. Very pretty shades. I like the purple & blue.